Company: "A substantial majority of the 126-member crew is safe"
(CNN) -- The U.S. Coast Guard launched a major search effort Wednesday for 11 people missing after a "catastrophic" explosion aboard an oil rig in the Gulf of Mexico engulfed the drilling platform in flames. 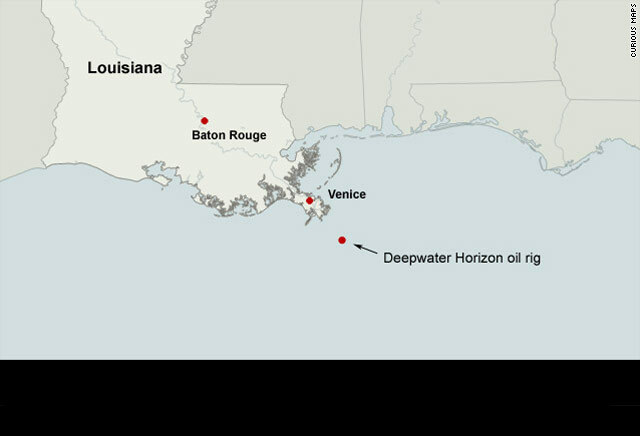 Another 17 people were injured -- three critically -- in the blast aboard the Deepwater Horizon, which occurred about 10 p.m. Tuesday. The rig was about 52 miles southeast of Venice, Louisiana, said Coast Guard Senior Chief Petty Officer Mike O'Berry. As of late afternoon Wednesday as many as six firefighting vessels were working to contain the massive fire caused by the explosion. An investigation into the cause of the blast is under way, but there are no indications it was a terrorist incident, the Coast Guard said. The Coast Guard dispatched helicopters from New Orleans, Louisiana, and Mobile, Alabama, to help evacuate workers from the rig and search for the missing. It also sent four cutters to the scene. Coast Guard Rear Adm. Mary Landry said search and rescue crews in the air and sea were prepared to search through the night for the missing workers using infrared devices. It was not known whether the workers were able to make it to one of the rig's lifeboats -- fully enclosed, fire-resistant vessels designed to evacuate people quickly. Officials said 126 people were on board at the time of the explosion. Of the 115 accounted-for workers, 17 injured were evacuated by helicopter from the rig. Another 94 people were taken to shore with no major injuries, and four more were transferred to another vessel, according to the Coast Guard. Several people were hospitalized, including at least two who were taken to a mobile trauma center. Six people were taken to the University of South Alabama Medical Center in Mobile, according to spokesman Bob Lowry. Five were treated and released, and one was admitted to the facility's burn center, Lowry said. Adrian Rose, a vice president for Transocean Ltd., the company that owns the rig, said Wednesday that "we are deeply saddened by this event. Our thoughts and prayers are with the crew members of the Deepwater Horizon and their families." Transocean's website describes the company as the "world's largest offshore drilling contractor and the leading provider of drilling management services worldwide" with 140 offshore drilling units. The rig involved in the explosion -- a mobile unit that moves to different locations in the Gulf of Mexico -- had been drilling for oil in its current location since January, said Eileen Angelico, a spokeswoman for Minerals Management Service, the agency that regulates the oil industry in federal waters. The rig had undergone at least three safety inspections since January, according to Deputy Secretary of the Interior David Hayes. Before the blast, there was "no indication of any problems" as crew members carried out routine work around the drill site, Rose said. He said the vessel didn't appear to be in danger of capsizing after the blast, though it was listing up to 10 degrees by Tuesday evening as fire damaged the rig and water from the firefighting vessels added weight. Seven major oil spill response vessels were being dispatched to the scene to help prevent any polluting of the waters in the vicinity. "If there is any pollution, we believe it is minor pollution because most of the oil and gas is burning," said David Rainey, a vice president for BP. But he warned the situation could change once the fire is contained. However as of Tuesday afternoon, there was only a moderate sheen in the water and not a large spill, Landry said. Photos and videos released by the Coast Guard showed workers being evacuated from the scene by helicopter and a massive plume of smoke reaching hundreds of feet into the air as vessels poured water on to the burning rig. Fires on oil rigs are rare because engineers design them with safety in mind, said Greg McCormack, director of the Petroleum Extension Service for the University of Texas. "They've built safety into the rigs. They've built safety into the operations, because they know that if you have a fire on an isolated rig that's out in the Gulf, you have a real issue," McCormack said Wednesday. Even with lifeboats on hand, evacuating rigs is difficult, he said, and emergency crews can be delayed. "The worst thing that can happen on an oil rig is you have a fire, and then you have to evacuate without the fire being put out, because then it can only get worse," McCormack said. 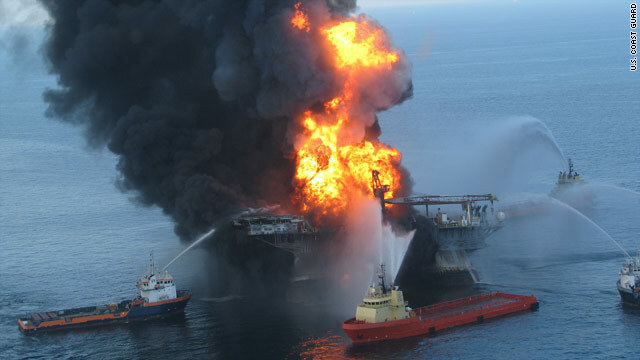 The Minerals Management Service said 39 fires or explosions were reported offshore in the Gulf of Mexico in the first five months of 2009, the latest period for which statistics are available. The agency categorized all of those incidents as "minor" or "incidental." According to the Minerals Management Service, there are 90 active rigs working in U.S. waters in the Gulf of Mexico. The agency puts the level of oil production in the Gulf at 1.7 million barrels per day and 6.6 billion cubic feet of gas per day as of October 2009.